As a cat or dog owner, you should be aware of the food that you can buy for your pets. Basically, there are two types of food and they are organic and non-organic pet food. You need to know the differences between these food types. You should only buy the best food for your pets which provide a balanced diet so your pet will live a long and healthy life. Feeding your pet with good or bad food will impact their health. This article will cover both the non-organic and organic pet food. 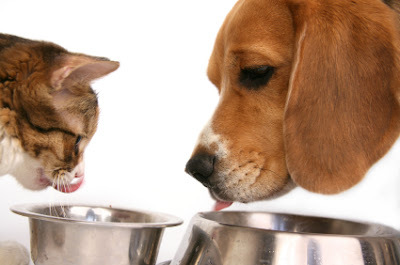 There are some manufactures that produce good quality and healthy non-organic cat and dog food. You have to read the label to determine which is the healthiest. Do not be confused with the bag and the advertising that is on it as it can be misleading. Not all cat and dog food are alike. In most cases, non-organic pet food is usually cheaper than organic. The reason being is the USDA (United Status Department of Agriculture) has policies covering organic pet food. What most pet owners should become familiar with is the label printed on the package. This is where you will find which food is actually best for your pet verses another manufacturer. You will find the ingredients that were used in processing of the cat or dog food on the label. The label information printed on the package is regulated by AAFCO (The Association of American Feed Control Officials). For cat and dog food, the first ingredient should be meat and not meat by-products or fillers. By-products and fillers are not healthy for your pets and should not be fed to them. The reason they are used is because they are cheap to the manufacturer, whch helps to keep the price of the food down. All manufacturers must list the ingredients in order by weight. Also look for the type of preservatives used in the process. Avoid BHA, BHT, ethoxyquin, artificial flavors and colors or flavoring agents. These can cause harmful effects on your pet’s health over time. The old saying is true, if its not good for humans, it is not good for your pet. Organic pet food does have some regulations which are governed by the USDA. There are three levels in organic pet food and they are: 100% organic, organic, and made with organic ingredients. In order for a manufacturer to advertise its product as “100% Organic” it must have all of the ingredients certified as organic in the process. Manufacturer’s can display the USDA Organic Seal on the packaging and advertising. A product certified as “organic” its ingredients must be 95% organic. Manufacturer’s can display the USDA Organic Seal on its packaging and advertising. Products advertised as “made with organic ingredients” must have 70% of the ingredients used in the process as organic. It cannot display the UDSA Organic Seal but, can display the logo of the certification body that approved them. Products with less then 70% of organic ingredients cannot advertise this to consumers but can only mention them in the ingredient statement. Generally, organic food is healthier for your pet. Also, you will use less food when feeding your pets because of the high quality ingredients being used in the process. Organic food is more expensive than non-organic food. Just like non-organic food, organic foods are not the same. Look at the label and the list of ingredients. There you will find the quality of the organic ingredients being used in the process. This should help select which food to buy. Days 1-4. Mix 25% of the new food with 75% of his current food. Days 5-8. Mix 50% of the new with 50% of the old. Days 9-12. Mix 75% of the new with 25% of the old. Day 13. 100% of the new food.